Designed in 30 combinable patterns, you will find the atmosphere and harmony you want to create. Elegance is produced in 2 thicknesses, which should be used according to the traffic. 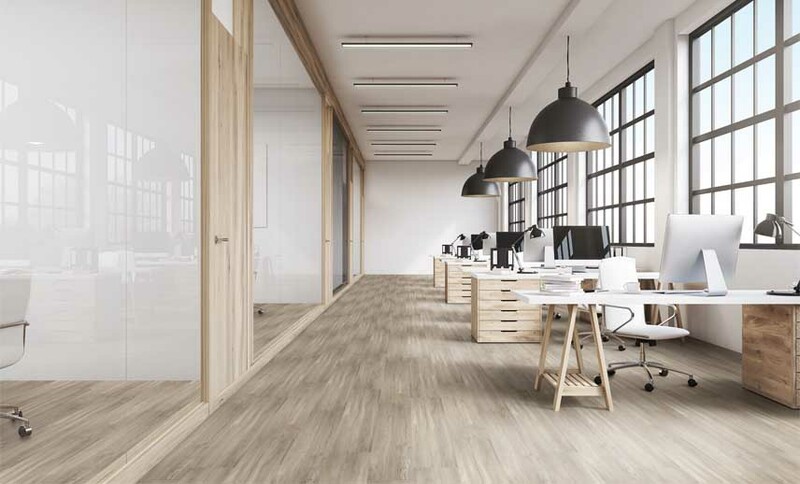 Elegance is the perfect flooring for shops, hotels, supermarkets, offices but also private homes. Woods from Canada, Siberia or Alaska like pine or white oak. White or grey tones, modern and warm that will highlight and give volumes to your spaces. The stone and minerals will convert your interior into an elegant and cozy space. Our slates and travertines will definitely bring a warm touch of nature. Our vinyl floorings Elegance have to be glued on a dry and even surface with a water-based acrylic adhesive. In case of humidity in the sub-floor, a bi-component PU adhesive can be used. In order to offer an easier and cheaper maintenance, our vinyl floorings Elegance are protected with the Supraclean® treatment. The pores of the floorings are sealed, avoiding the dirt to penetrate. Elegance must be cleaned with a neutral detergent for vinyl floorings (Dr. Schutz, Ecolab, Johnson). The cleaning can be made either manually or with a rotative cleaning machine. CALL +34 93 583 18 18 or email us via our contact form.